Champaign-Urbana is located in central Illinois and has a combined population around 120,000 with the university. The university brings a wide variety of luxuries that other rural towns do not have. There are two major centers of activity: downtown Champaign and downtown Urbana. Both have a large swath of restaurants and bars to choose from for night entertainment. There are also movie theaters, a bowling alley, and roller skating in the area. The Krannert Center on campus has many cultural events throughout the year and the Assembly Hall on campus often has larger concerts and venues. If you prefer a quiet night in, the Champaign and Urbana public libraries have extensive selections of books, movies, and music to peruse. 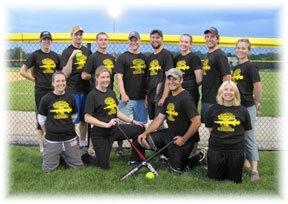 Champaign-Urbana is home to many parks and interesting locations to walk, run, or bike. It also hosts a variety of festivals in the warmer months, including A Taste of Champaign and the Blues, Brews, and BBQ Festival. The Champaign and Urbana Park Districts often host outdoor concerts, nature programs, dance and art classes, and many fun special events for people of all ages. The Champaign County Forest Preserve also hosts many trails and opportunities to volunteer. Nearby Parkland College also offers a variety of classes on everything from cooking to writing to belly dancing. If you’re looking to get away for a weekend, 3 major cities are a 3 hour drive from Champaign-Urbana. There is an Amtrak line that passes through Champaign and runs from Chicago to New Orleans. A train ticket to Chicago can range between $14-40, which is a cheap alternative to driving. Champaign also has Willard airport, with direct flights to Chicago and Dallas, from which you can fly almost anywhere. 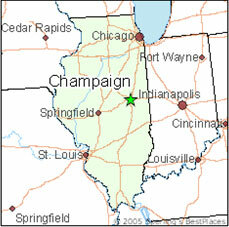 Champaign is within easy driving distance of Chicago, Indianapolis, and St Louis. 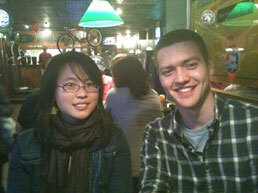 Plant Biology student enjoying Murphy’s after a long day of work. 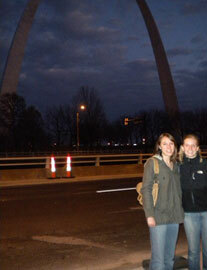 Plant Biology students touring St Louis. In addition to our grad student group PBAGS, there are many opportunities to get involved in the larger Champaign-Urbana community. Urbana has several co-ops that include an art co-op and a bike co-op where you can learn to build a bike from scratch for yourself – even crazy double seaters! In addition to our own Plants iView and other outreach programs through the department, there are a variety of places to volunteer in the area, from soup kitchens to the animal shelter to the parks service. The Office of Volunteer Programs at UIUC has a listserv full of opportunities each week and more information can be found on specific locations’ websites as well. The University of Illinois offers a wide variety of organizations for any interest, from religious to cultural to just for fun. Quad Day is an event held each August where students can get to know more about these clubs. Graduate students have also participated in local bands. 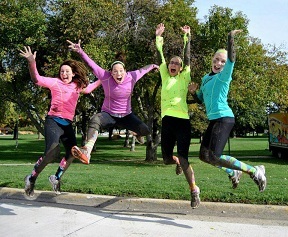 Plant Biology student and friends after completing the Obstacle Mobstacle. 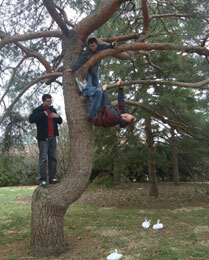 Plant Biology students climbing a tree. Champaign-Urbana has a wide variety of food options ranging from traditional to ethnic and casual to more formal dining in all price ranges. Green Street is a great place to walk to for lunch and a break from lab. 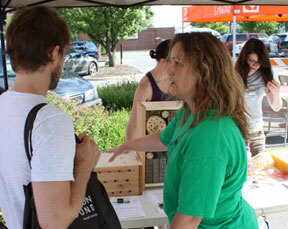 There are also many other places in downtown Urbana, Champaign, and elsewhere throughout the cities. Champaign-Urbana has all the typical grocery stores such as Schnuck’s, County Market, and Meijer, but also has a wide array of local produce and organic shopping options. The Urbana Farmer’s Market has in-season local produce that includes a wide array of fruits, vegetables, meats, eggs, and locally made crafts. The Farmer’s Market runs from 7am-12pm on Saturdays in the spring through fall. Urbana also has the Common Ground Food Coop which promotes local and organic food production and Strawberry Fields which is a natural foods grocery store. There are several coffee shops that are only a couple minutes’ walk from anywhere on campus, including Espresso Royale, Paradiso, and The Array Café. Hopefully these links help you get started, but Craigslist is always a good source of apartments/furniture/etc. Not as many buses, but is typically closer to campus. With the extensive bus system and the implementation of new bike paths throughout town, a car in not really necessary. This being said, it is nice to be able to drive to get groceries which can be located on the outer edges of town. When choosing where to live, check bus and bike routes in the areas you are looking at, especially if you are not planning on having a car.